Science and Art for Creativity. The Berlin-based manufacturer Black Cat Audio is making high-grade OEM electronics since a long time. 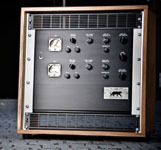 From 2014 on a series of professional audio products is presented under the own brand, bringing modern interpretations of historic benchmark designs to new live through carefully handmade products. Further mastering-grade developments will follow in the near future. We are exclusive distributor for black cat audio. 1:1 replica of the Fairchild 670-compressor - 20 tubes, 6 transformers. Delivery including 19" wooden rack. 5 years warranty!